Approximately 4.2 million youth in America are experiencing homelessness. Unfortunately, being homeless is something that is not always visible to the public eye. Homeless youth, in particular, are a hidden population that often couch-surf with friends, and are left out of most Point-in-Time counts. Still, current data indicate that youth homelessness is on the rise. From the US to the UK, nations across the world have seen an increase in their homeless youth population. In some US states, the homeless youth population has tripled. Meanwhile, a fifth of young adults in the UK are currently homeless. Why is there an increase in homeless youth? Recent statistics also show that 40% of homeless youth are under 18, 40% identify as LGBT+, and 50% are aging out of the foster care and juvenile justice systems. These numbers indicate that homeless youth are in need of trauma care, housing, education preparedness, and employment training services. At NotEnoughGood, we have written about the needs of people experiencing homelessness in multiple blog posts. (See This, This and This as examples) You can read even more about this in our Homelessness Blog Series by searching the keyword ‘homelessness’. There are also countless research articles on the web that explain the contributing factors to youth homelessness, but unsafe households and involvement in the child welfare or juvenile justice system remain at the top of the list. Now that we know why youth become homeless, the next step is learning how to alleviate this social crisis. Homelessness doesn’t have a one-size fits all solution, but prevention is always a great start to any social problem. 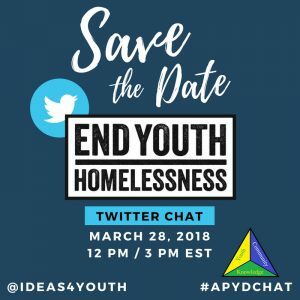 Ending youth homelessness requires collective action, so we invite you to join our Twitter chat on March 28th at 12PM PST/3PM EST where we will discuss prevention strategies with special guests: Erin Chapman-Smith and Emma York Jones, Directors of Housing and Shelter Services at YouthCare Seattle, Washington. Can’t make it to the chat? You can still participate throughout the year by sharing information about youth homelessness on social media using the hashtag #APYDCHAT. Our youth homelessness conversation doesn’t stop here. We will continue the conversation on August 7th, 2018 at APYDCON, our FREE, Best Practices for Youth Development Virtual Conference. Sign up here to receive APYDCON updates or follow us on Facebook, Twitter, and Instagram.